Eddie And Ernie comprised of: Edgar William Campbell (d. 1990's) and Ernie L. Johnson Jnr (b. 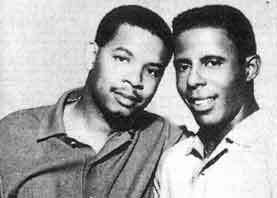 22nd October 1943, Lubbock, Texas Eddie & Ernie were the Phoenix-based soul duo of Eddie Campbell and Ernie Johnson, issuing about 15 singles between 1963 and 1971. To make matters a little confusing, some of the singles were credited to Ernie & Eddie, the New Bloods, or Ernie & Ed. There were also 1967 solo releases by Campbell and Johnson. Running through about a dozen labels, they never got any significant chart action, though some of the singles appeared on relatively big imprints like Columbia, Chess, and Buddah. They were good soul singers, though, often recording their own material, sometimes sounding a little like Memphis or Alabama deep soul singers with a slightly less avowedly church overlay, sometimes going into more minor melodies and downbeat subject matter than most such soul performers did. 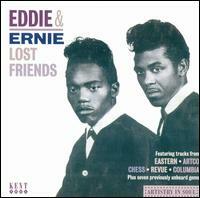 Eddie & Ernie, like so many soul singers, did some time in gospel groups as youngsters before hooking up as a duo. They first worked in the studio as background vocalists on a 1961 single by Little Worley & the Drops, and sang background on other singles before making their first recordings as a pair (initially as Ernie & Eddie) in 1963. That set off a trail of singles that took them through many labels, including Nightingale, Checker, Tomorrow, Eastern, 20th Century-Fox, Chess, Shazam, Columbia, Artco, Revue, and Buddah. Though some of their singles sounded as if they could have been done in Memphis or Muscle Shoals, they also did poppier sad ballads and dance tunes with a more Northern production feel, and in fact these are more distinctive than their churchier deep soul-ish recordings. In the early 1970s, the two served as singers in a Phoenix band called Phoenix Express, though just one song has surfaced, and then decades later on a CD compilation. Eddie Campbell died shortly after Phoenix Express made their early-1970s recordings. In 2002, the Kent CD Lost Friends assembled two dozen tracks spanning Eddie & Ernie's career, including solo endeavors, previously unreleased material, and recordings on which they sang that were billed to Phoenix Express, the New Bloods, and Little Worley & the Drops. SINGLES - in no particular order - due to the fact no-one knows!! Pic & Bill were Charles Pickens and Billy Mills from North Carolina. During 1965-1970 they had relocated to Texas having come to Major Bill Smith's attention at a local gig. Their discography (and Charay's for that matter) is a REAL mess. Charay 60 was for example released at least 7 times(!) with different flipsides. Le Cam 303 - 30 Minutes Of Soul [LP] 12 O'Clock ??? - 30 Minutes Of Soul [LP] - 197? ~ = labeled "Vocal by: PIC & BILL" in tiny lettering. = "How Many Times" is Pic solo. "Patsy" and "Cool" are the same tune. 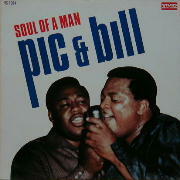 Soul Record 1 - The Soul Of A Man / ??? Formed in 1962, Sam and Bill comprised of: Sam Gary (b. Columbus, South Carolina, U.S.A.) and Bill Johnson (b. 16th October 1932, Augusta, Georgia, U.S.A.). Sam and Bill were an R & B vocal duo formed in Newark, New Jersey, U.S.A. They were typical of a new 'gospel style' of soul duo typified by the likes of Sam And Dave, the Righteous Brothers and the Knight Brothers. Bill Johnson first recorded for Sun Records. He was a member of a group called the Steps Of Rhythm. Sam Gary was originally the guitarist for a group called the Soul Brothers. Coming together in 1962 the pair had hits with remakes of two pop ballads, 'For Your Love' (number 14 R & B, 1965), which was a remake of Ed Townsend's 1958 hit, and 'Fly Me To The Moon' (number 38 R & B, 1966). Their record company JoDa then folded and the duo broke up. JoDa was owned by Johnny Nash. Johnson recruited Sam Davis Jnr (b. 10th December 1940, Winston-Salem, North Carolina, U.S.A.) to be the new replacement.The new Sam was Sam Davis Jnr, from Winston-Salem, North Carolina. 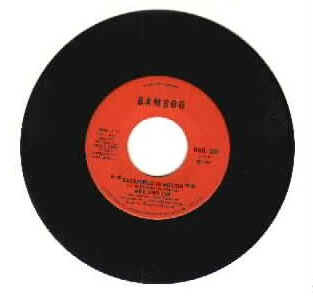 The 'new' Sam and Bill recorded for Brunswick Records in 1967 and Decca in the U.S. A single I Feel Like Cryin' (Brunswick 05973) was in the Big L 'Soul Set' playlist. 'I Feel Like Cryin' (penned by Jesse Wilson) was re-released on the Ace Records compilation 'Dave Godin's Deep Soul Treasures Volume 1' in 2001. Maurice & Mac emerged when Maurice McAlister and McLauren Green splintered from the Radiants in 1966. McAlister was a founding member, lead singer, and songwriter for the group; Green replaced first tenor Charles Washington before the Radiants started recording for Chess Records. the Radiants, composed of members from the Greater Harvest Baptist Church Youth Choir (located in Chicago, IL), formed in 1960 to record some stellar but poorly promoted singles for Chess Records. On their biggest record, "Voice Was Choice" (1964), the members were McAlister, Wallace Sampson, and Leonard Caston. The Army snatched Green, and Caston, an organist at Greater Harvest, had recently returned from the service. "Voice Your Choice" went to number 51 pop and number 16 R&B, but deserved better; its successor, "Ain't No Big Thing," scraped into Billboard's pop 100 at number 91, but did better on the R&B chart (number 14). Later editions of the Radiants consisted of different members and a different sound. The group was initially a quintet, then a quartet, a trio, then back to a quartet before disappearing. 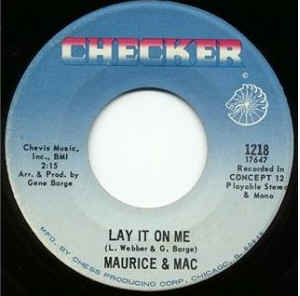 The first Maurice & Mac single surfaced around 1967 or 1968 on Checker Records, a subsidiary of Chess. But "Try Me" b/w "So Much Love" went unnoticed by everyone except the parties involved with the recording. Their second release brought some acclaim, but no fame, and no fortune. "You Left the Water Running," released in 1968, and written by Dan Penn and Sponner Oldham, is one of the best Southern soul recordings, period. Yet, it never made Billboards' pop or R&B charts; Cashbox's survey listed it for three weeks, but it never rose from the bottom rungs. Recorded at the Fame Studios in Muscles Shoals, AL, the production is so tight that the vocals and the instrumentation literally explode from the compelling, shuffling track that reaches its zenith with a gut-wrenching "Lord Have Mercy" near the end. Chess did an awful job promoting the single and the guys were fuming. But they forged on with a third single, "Lay It On Me" b/w "What Am I Gonna Do," which few people knew about, much less purchased. The fourth and last Checker single, "Baby You're the One" b/w "Oh What a Time," duplicated the dismal showings of the first and third singles. The last-known release by Maurice & Mac surfaced on Chess Records. But the move from Checker to the parent label didn't help, as "You Can't Say I Didn't Try" b/w "Lay It On Me" failed miserably and became the final straw. They gigged sporadically but received no support from Chess Records so there were no tours. Chess is lauded for their recordings, and should be, they waxed some remarkable sides, but none of their artists enjoyed long careers, and few had album releases. Neither the Radiants nor Maurice & Mac ever had an LP release on Chess. When Maurice & Mac disbanded, McAlister washed his hands of the music business. After a promising start with the Radiants, and writing songs for others, such as Sugar Pie Desanto's "Soulful Dress," McAlister's songwriting efforts ended at 36 titles licensed by BMI. McAlister and Green still call Chicago home. Leonard Caston went on to write and produce Eddie Kendricks' two monsters, "Keep on Trucking" and "Boogie Down." Little do the rights owners of the Radiants' recordings know, but to many, the Radiants, and Maurice & Mac were all that, and a compilation CD chronicling their respective careers is long overdue. 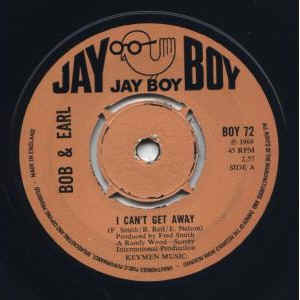 Bob & Earl had already recorded under a myriad of pseudonyms during their careers before they were a duo; both "Bob"s (the first was Bobby Byrd, aka Bobby Day, and his replacement was Bobby Relf) and "Earl" (Earl Nelson) were key players in L.A.'s doo wop and R&B vocal scene in the mid-to-late '50s. Today, Bob & Earl are best remembered for their minor-key rumbler "Harlem Shuffle," which provided the listener with instructional R&B dance moves for an accompanying dance also called the Harlem Shuffle. 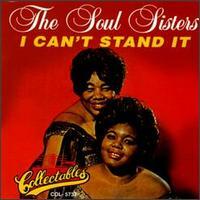 Their vocal interplay presaged Stax Records' Sam & Dave. When "Harlem Shuffle" was originally released, it climbed into the lower rungs of the American Top Forty (number 36 Cashbox/number 44 Billboard), but the song achieved its biggest chart success when it was re-released in 1969, becoming a Top Ten U.K. hit. Bobby Byrd (b. July 1, 1932, in Fort Worth, TX) was the first "Bob," although he is better known today for writing three early rock & roll classics between 1957 and 1958. He had been one of the founders of the Hollywood Flames in 1950, a prolific group -- along with the Robins, they were one of the grandfather doo wop groups in L.A. -- who waxed singles for Recorded in Hollywood, Specialty, Lucky, Swingtime, Money, and other labels before the group finally had their first major hit, "Buzz, Buzz, Buzz," a number 18 pop hit for Ebb Records in 1958. By 1957, however, Byrd (under his new name, Bobby Day) had cut the original version of his self-penned "Little Bitty Pretty One" for Class Records. 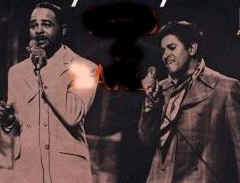 When a nearly identical cover version by Thurston Harris (featuring the Sharps) beat Byrd's original to the punch and turned out to be a huge hit -- it was Harris' one and only Top Ten R&B and pop hit for Aladdin -- Byrd switched gears and started a solo career, using the name Bobby Day. One theory about where the new last name came from is that Class Records' "Googie" Rene (owner Leon Rene's son, and the label's A&R director and producer) suggested it. Regardless of how he got the new moniker, Day bounced back with a hit of his own, "Rockin' Robin," which topped the R&B charts in 1958. Day waxed a few more hits for Class, including "That's All I Want" and "The Bluebird, the Buzzard and the Oriole" in 1959. 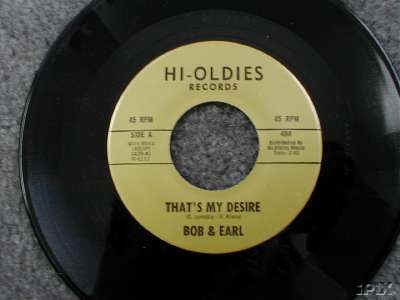 It was during this time that Earl Nelson formed the first incarnation of Bob & Earl. Nelson (b. September 8, 1928, in Lake Charles, LA) had also been an original member of the Hollywood Flames; that's him singing lead on "Buzz, Buzz, Buzz." By 1960, however, after a stint on Atco, the Flames eventually ended up on Edsel, at which point Nelson and Day ventured off to form Bob & Earl on their own. 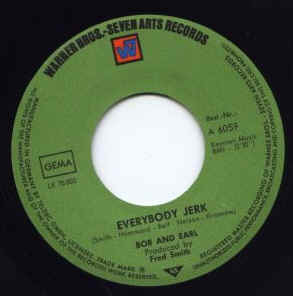 Day left Bob & Earl before they produced any hits, however, and Nelson soon re-configured the group with a second "Bob," Bobby Relf. Relf had already led several L.A.-based acts in his career, including the Laurels and the Upfronts (featuring Barry White), and was also a replacement member of the Hollywood Flamesafter Byrd had left to join up with Nelson. Relf had also called himself "Valentino" for his short-lived group Valentino & the Lovers, an early-'60s group formed with the vocalists who had auditioned but had not been chosen to be in the lineup of Little Caesar and the Romans. Incidentally, White had also been a member of Valentino & the Lovers, singing bass and doubling on piano. The duo recorded several singles for various L.A.-based labels, but their lone hit was "Harlem Shuffle," a dance number punctuated by trumpet blasts and echo-laden percussion. It was arranged by a young Barry White, who played piano. Produced by Fred Smith (a talented R&B songwriter who had previously written hits with partner Cliff Goldsmith and produced the Olympics among others), "Harlem Shuffle" was originally released in the U.S. on the Marc label in 1963. It climbed into the low end of the American Top Forty in 1964 before slipping off the charts. However, the duo failed to follow up with any additional hits and soon were splitting for solo careers. Helson began recording solo tracks under a bunch of aliases, including Jay Dee, Earl Cosby, and Chip Nelson, but his biggest success was as Jackie Lee (Jackie was Earl's wife's name and Lee his own middle name), for another popular R&B dance cut in 1965, "The Duck," for the Mirwood label. A year after "Harlem Shuffle" slid off the charts, Nelson was touring the U.S. (with Barry White on drums). Relf waxed singles under the names Bobby Garrett and Booby Valentino. "Harlem Shuffle" was re-released in 1969, and became a Top Ten U.K. hit (number seven pop). 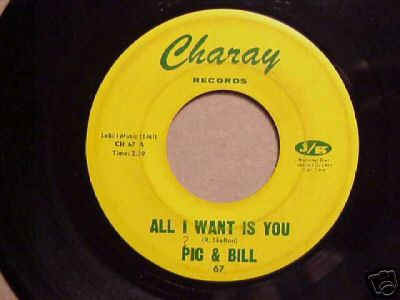 Since its 1963 debut, the song has seen numerous cover versions. Original "Bob" Bobby Byrd passed away on July 15, 1990. Born in Magee, Mississippi. Twin Estus is older than Lester by 15 minutes. They were in a gospel group called the Southern Sons. 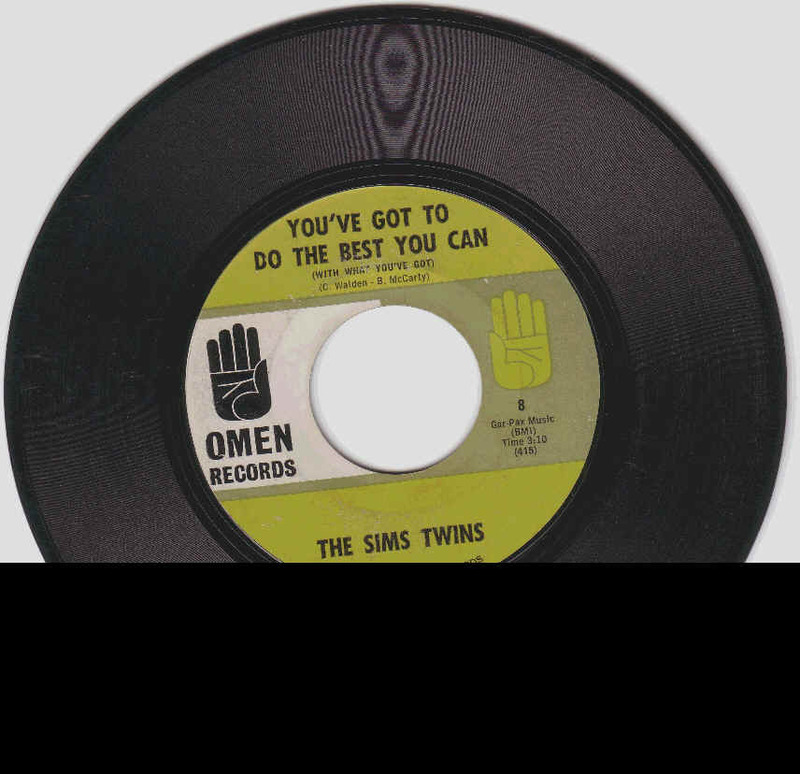 Broke away from the group and started a duo and were known as the Soul Twins. First recording was the lengthy titles in Big Beat - 'Something You Got And It's Worthwhile Having, Hold On To It / Come On Everybody Get With Beat, Let Me Take You To Soul City USA.' PHEW!! 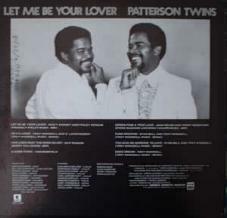 For their next contract they changed the name to the Patterson Twins and joined Star Fox Enterprises with 2 singles being released on King. Firts was a George Jackson track titled 'If I Ever get You Back'. Later they did a one-off at Malaco cut at Muscle Shoals. In the early eighties they started their own company Kon-Kord with the first release being distributed by Montage. Estus eventually took complete control of the company and released product on artists like Queen Isabella, Sterling Harrison, Bishop Hudson & Rusty Jackson. Every town in the US had its own cut-price Sam & Dave in the 60s - and Baltimore's were Gene & Eddie. 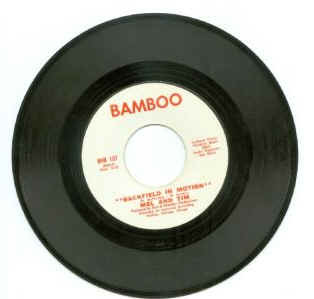 They cut a very strong series of 45s for local label Ru-Jac, ranging in styles from doo-wop to funk. "Its So Hard" and "Darling I Love you" are very good, "Let Me Go Easy" is superb, and "I Would Cry" is a fine example of their church based approach. The guys sing some great harmonies over a big, well arranged horn section and a plodding rhythm, with some nice guitar and organ lines. Passion, power and commitment are all here - with some super ad-libbing at the run out groove. Gene & Eddie had a final 45 on Mon'ca that the modern crowd go for. Cousins Mel Hardin and Tim McPherson were born and raised in Holly Springs, Mississippi, USA, and later moved to St. Louis, Missouri. 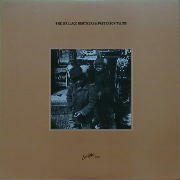 They were signed to Gene Chandler's Bamboo label and reached the US Top 10 with "Backfield In Motion" (1969). 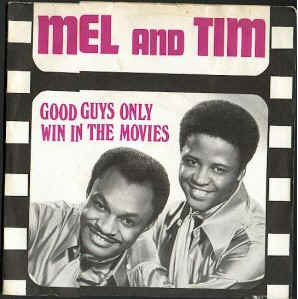 A vibrant single, it was followed by "Good Guys Only Win In The Movies", after which Mel And Tim switched to Stax. The sumptuous "Starting All Over Again",written originally by Phillip Mitchell and with Sam & Dave in mind, was another major R&B hit, but further singles, including "I May Not Be What You Want" (from the film Wattstax), had less success.